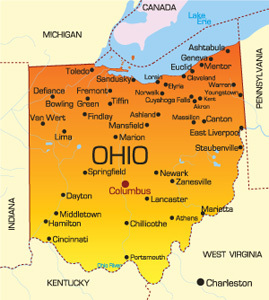 Ohio is the 7th most populous state in the United States and is nicknamed The Buckeye State. The total population is just over 11 and a half million people, of which nearly one million live in the capital city of Columbus. The bordering states are Indiana, Michigan, Kentucky, West Virginia, and Pennsylvania. The major highways that run throughout the state include I-70, I-270, I-71 and SR 315. Other modes of transportation such as air travel are facilitated by airports like the Port Columbus International Airport. Notable universities in Ohio are The Ohio State University, Case Western University and Miami University. Tourism is brought into the state through athletic events at The Ohio State University, amusement parks like Kings Island and Cedar Point, and Lake Erie.